There's nothing like a big bowl of chili after a hard day. My favorite time to make chili is in the fall of the year when the are starts to get a nip in it and the leaves start to change. I think once you try this chili, you will agree that it will warm you heart and soul. In a large pot, brown ground chuck. Drain and return to pot. Add the onion, green pepper,cumin, chili powder, black pepper, salt, tomato sauce, diced tomatoes, kidney beans, pinto beans, beef broth and sugar. Stir. Bring to a boil, reduce heat, simmer on low heat, uncovered for 2 hours. 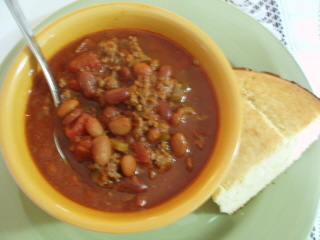 I hope you enjoy Mama's recipe for chili!